By John Miller | October 4, 2018 | This post may contain affiliate links, which means we may receive a small commission, at no cost to you, if you make a purchase through a link. Read our Disclosure. We are always trying to make our travel life easier so we can spend more time experiencing the places we visit. 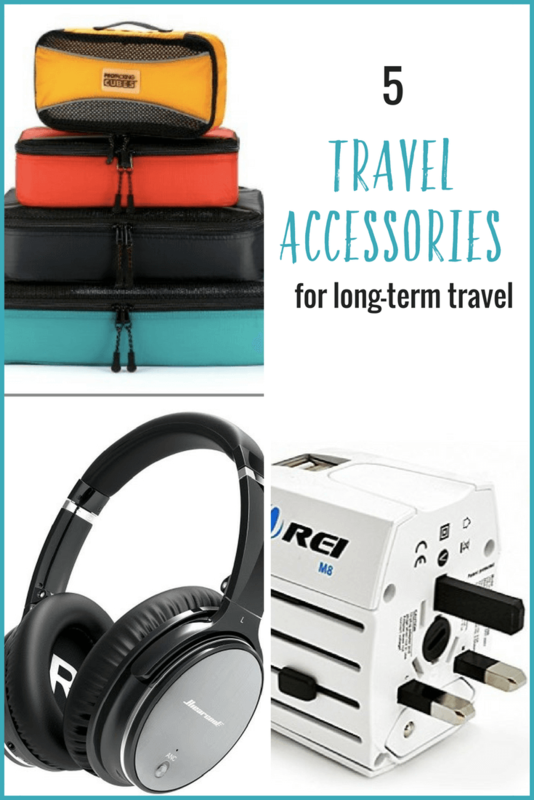 There are lots of travel accessories we think we need, but what is essential for your long-term travel plans? With so many choices, what are the best travel products you can bring along to improve your long term traveling? You don’t want to bring too much along with you because you’ll be carrying these items around with you in your suitcase for a long time. But with a little planning and whittling down the essentials you will be sure to have everything you need. Below are a few examples of some of the best travel accessories that will make your life easier on the road. 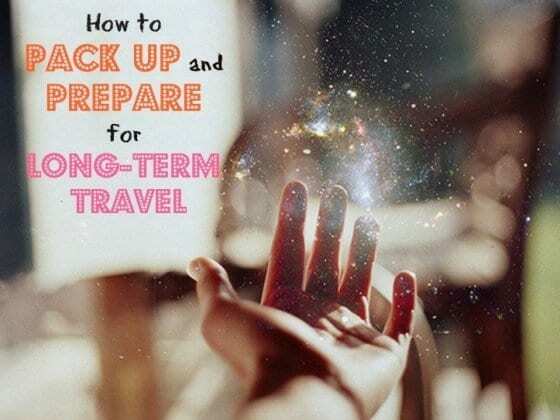 Keeping your bag in some kind of organised state can be difficult when travelling long term. 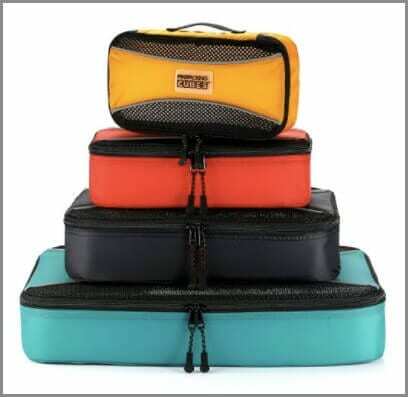 One way to keep your bag organised is to use packing cubes. These cubes are a great way to keep your clothes and other items separate. Pack your different items in cubes, tops in one, trousers in the other. Also use them for laundry to keep dirty and clean clothes separated. You can even use them as a travelling wardrobe, only taking out which cubes you need at each time. If you can’t decide which ones to choose, then take a look at these best packing cubes review and find the best ones to suit you. As well as packing cubes, other luggage accessories to consider bringing are travel bottles. Some mini bottles come in handy when you don’t want to carry around large bottles of toiletries. Decanting your favorite items into smaller containers means you can bring along everything you need without the bulk and weight. Larger ones are also great to use and fill up water or other beverages! You never go anywhere without your mobile phone nowadays and they can be a useful tool for travel. There are so many apps out there that are beneficial for both long and short-term travel. There are the well-known apps for reviews such as TripAdvisor which will give you traveler information about restaurants, locations and hotels. It’s best practice to check out reviews before you book to avoid disappointment. Also, really beneficial are Language apps that will help you converse with locals. These apps include Duolingo and Babbel, these can be really beneficial when in a spot with language difficulty. You might want to use apps to meet people too. These apps such as Meet Up, Eat With a Local and Party with a local, enable you to meet like-minded people in your destination. 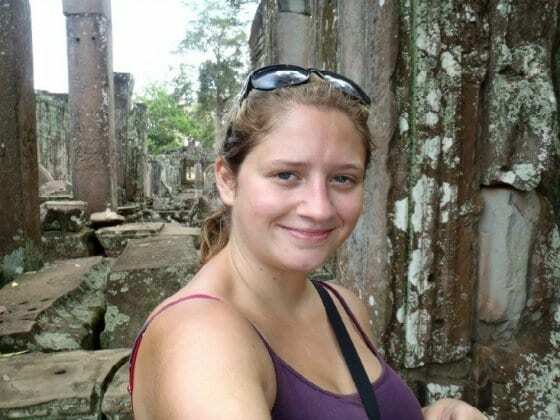 Make new friends or find someone to go on a tour with you, great if you are a solo traveler. Partying with new people has never been so easy. Your mobile phone may just be your best travel accessory yet! Looking for travel gadgets to bring along on vacation with you that can have lots of uses at different parts of your trip? 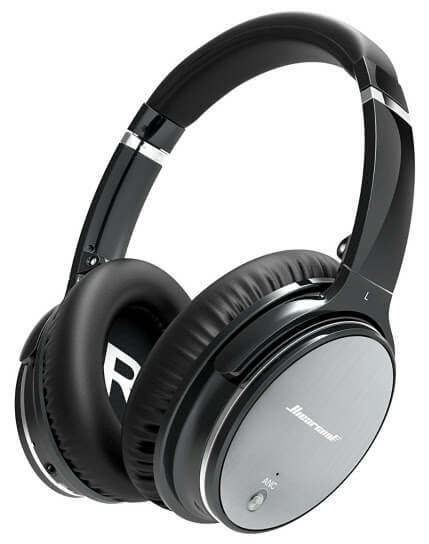 If you are traveling long-term and taking lots of flights then you might want to invest in a pair of noise cancelling or noise isolating headphones. If you are planning to get some sleep on your long flights then blocking out the noise can be one step towards a good sleep. Headphones can be a lifesaver if you are staying in a hostel and need some sleep or feeling particularly unsociable. Block out the noise or give yourself some alone time, listen to some music and relax. On the other hand, when you are watching TV or doing some language learning, you will keep the sounds from annoying anyone else. There’s always that chance of rain no matter where you are. I have been caught in many a rain shower and a trusty Pac a Mac is the perfect solution. Having this with you means you can carry on with your journey or at least keep yourself dry whilst you wait out the rain. It can happen in the best of places and sometimes without warning. Yes, you could buy a rain cover en route or duck in somewhere are hide whilst the storm finishes. But you don’t want to waste precious time in your destination either. So, brave the rain, don your Mac and enjoy! Thinking about what clothes you are wearing, make sure you pack small and think big. Bring versatile clothing that mix and match and work for the places you will be visiting. 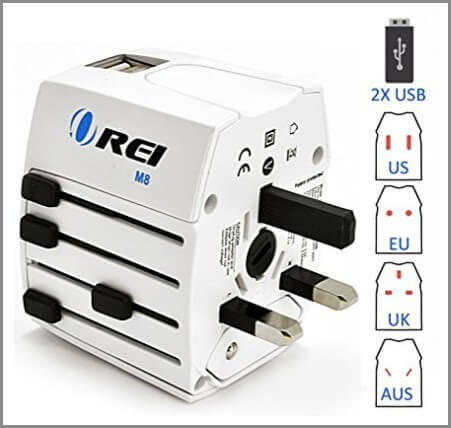 When you are traveling from place to place, especially through different countries you’ll need an international plug adapter. There’s nothing worse than realizing you can’t connect or charge your electronic device whilst you are away. It can be costly to buy adapters on the road and they may not be fully safe either. Making sure you bring the right converters and adapters to your destination is essential to improve your travel experience. Plan ahead so you know what kind of adapters you need and if you’ll be staying anywhere that you need a special kind – Universal adapters won’t work in some places in Africa for example. You also need to remember all your leads and a portable battery charger for your various electronics. Keeping them in their own special electronics packing cube makes finding what you need in your luggage a whole lot easier. There is always something you can’t live without whilst traveling and everyone has their favorite travel gear. Whether it’s a comfy travel pillow, ear plugs or headphones to block out the noise, or those trusty walking boots. There are many things that could make the list but as you can see the above five items are a must have for a long-term traveler. What travel items would you add to the list? Leave a comment below. I got this travel pillow for on board planes that you wear a bit like a car seatbelt. It is amazing for leaning your head against to prevent neck aches! Thanks, guys. We take a nightlight so that in those dark hotels rooms, cave dark cruis ship cabins we don’t bust our toes while up for a late night bathroom visit. We also pack a multi-tap power strip for charging all those “essential” items. And we pack easy wash/dry clothes when we travel solely in our backpacks (30-40 liter bags). This makes even hand washing items and allowing them to dry over night much easier! Great list, guys! As a pilot I´m constantly travelling and have definitely made use of quite a lot of things on this list – the adapter plug as a definite travel basic. I´m also never without my kindle to kill time in a semi-productive way during long waits whilst on the move. I´ve also made an ultimate packing checklist which is downloadable on my page. Thanks for sharing the list of accessories, but these numbers are few. Would you mind adding more into it? Travel could be exhusting, adding a essentials to the trip such as cardholder helps to make checkouts and payments easier and faster. A great one in the Market right now is Mani Wonders. I got one of their Cascade Wallet and i found them very handy.